On Killing Eve Season 2 Episode 3Villanelle's new circumstances are looking bleak while Eve makes a dangerous deal with an old acquaintance. On Killing Eve Season 2 Episode 2, Carolyn introduces Eve to her new team before Eve briefs them on the case, while Villanelle lies low to recover. On Killing Eve Season 2 Episode 1, Eve is reeling from her act of violence against Villanelle and doesn't know whether she is alive or dead. On Killing Eve Season 1 Episode 7, Eve starts to question who she can trust, as tensions run high and the situation in Moscow begins to escalate. On Killing Eve Season 1 Episode 6 Villanelle is smuggled into the same Russian jail as Nadia. It’s a grim and brutal place, where not even Villanelle is safe. "I Have a Thing About Bathrooms"
On Killing Eve Season 1 Episode 5, Eve has the mole ensconced in a safe house and has an exciting opportunity to gather information and crack this thing open. 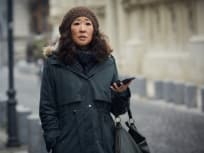 On Killing Eve Season 1 Episode 4, Villanelle heads to England to eliminate a member of British Intelligence, and Eve takes on her first surveillance operation. On Killing Eve Season 1 Episode 3 Eve and Bill travel to investigate Villanelle's latest kill. Villanelle enjoys the cat-and-mouse of their proximity. But as they draw closer, Eve realizes it's more than a game. "I'll Deal with Him Later"
On Killing Eve Season 1 Episode 2 Villanelle is ordered to take a break. Never one to do as she’s told, she goes ahead with her next mission regardless.